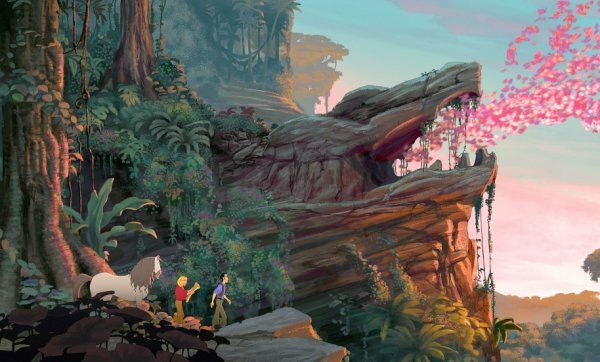 The Road to El Dorado is Dreamworks' 2nd major animated film release (the first being The Prince of Egypt). And it continues Dreamworks' theme of catering to an older audience (this one carries a PG rating, which is well deserved -- we see two men naked from behind, plus we are given many sexual innuendos). However, as if responding to some of the criticisms of its predecessor, it does have a bit more for the kids this time around (it is much more playful). If you are wondering whether or not to take the kids, I say "Go ahead." The adult stuff will go over their heads and there is much silly stuff that will get them laughing (mine sure did). Yes, it seems that The Road to El Dorado is a lighthearted one. And for that, I feel that I got my money's worth. However, there's not much that really grabs you, and for that reason it ends up being not at all memorable. I believe this latter point to stem from the fact that its characters are quite fanciful (i.e., that their struggles, if any, are hard to identify with). Thus, I probably won't rush out to see it again. On the plus side, this movie does very well at blending ancient Incan and Mayan history with legend. For example, it playfully depicts an ancient game of ball wherin the object of the game is to get a tiny ball through a tiny hoop several stories in the air and the losers are meant to be sacrificed (that's the history part) while set in a city made of gold by the gods (that's the legend part...or so we think!). As for the animation, it is very good. There are a couple of scenes in which the camera rotates around the characters showing a panorama of the landscape. This is very cool. However, the animation seems to take a slight step down from its predecessor, The Prince of Egypt. 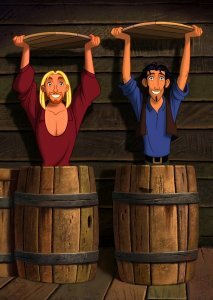 The lead characters are Tulio (Kevin Kline) and Miguel (Kenneth Branagh). These adventurous con artists remind one of many duos of the past, whether it be a Western, a action flick (how about Lethal Weapon? ), or even Titanic (remember how Jack and his friend won their tickets?). 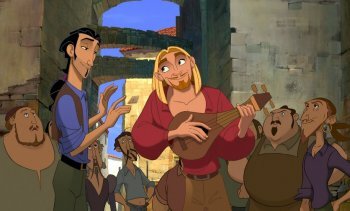 And here in El Dorado, Tulio and Miguel are a good team and very fun to watch. This, by the way, brings up a very interesting point. There really haven't been any major animated films featuring a lead team/duo that I can recall as of late. Just thinking back to some of the main titles brings up solitary character names (Tarzan, The Prince of Egypt, Mulan, Aladdin, The Little Mermaid, Hercules, etc.). A possible exception would be Woody and Buzz from Toy Story. Hmmm...at any rate, it is an element which has been missing and which I think works very well. And every great animated film needs good music with a couple of featured songs. So why not bring in perhaps the most successful team to date (those from The Lion King)? With music by Elton John (who collaborated with lyricist Tim Rice and composer Hans Zimmer -- all from The Lion King) you would have to expect great things. And the music is good. It has a nice Spanish flavor (and I love this type of music), but somehow it is not very memorable. I can't even recall a single song at this point (and I just saw it yesterday). No wait! I just thought of one ("Friends Never Say Goodbye"). So I guess I take that back. But I still emphasize the point that it is not a musical masterpiece, and I'll never buy the CD. This contrasts greatly to so many other animated classics that it really stands out as something that is lacking. Thus, I'm afraid, it seems that Dreamworks' investment in The Lion King trio did not quite pan out to fruition this time around. And you've gotta have a villian. This one comes in the form of a high priest named Tzekel-Kan (voiced by Armand Assante). Tzekel-Kan is consumed by the thirst for power and is constantly at odds with the benevolent Chief (Edward James Olmos). 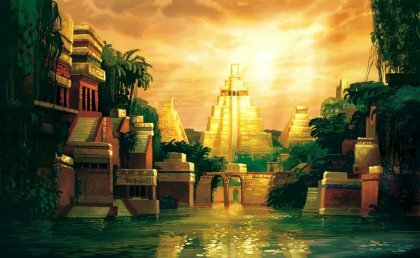 When Tulio and Miguel arrive, he envisions an opportunity to rise to power by usurping the Chief's authority and controlling the people of El Dorado through fear (which is meant to be brought about by blood-thirsty human sacrifices). Luckily for the city, Tulio and Miguel are not so easily maneuvered as his pawns. The long and short of it is that this is a decent film which provides some lighthearted adventure, but not much more. 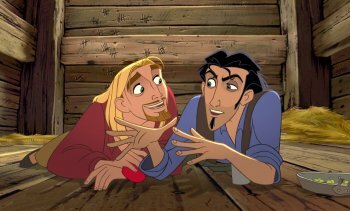 How would you rate the movie The Road to El Dorado? There have been 23306 people to visit this page since Sun, Apr 2, 2000. And you are the first person to visit this page today!